You won’t read this as you no longer use your eyes to see. You won’t hear me read it as you do not need your ears to listen and you won’t be able to tell me your thoughts (not that you would anyway) as you were taken away from us way too soon. But, you’re still with me, Dad. You’re locked inside my head and that’s where I will keep you safe always. You can’t get old there, you’re not ill there, you don’t feel pain and I hope, really hope, that through me you can see the little family we have created. I became a mum. Me? A mum! I am responsible for two little humans and I think being a parent has really changed me. It made me see the world a bit differently because I put a lot of others before myself in both my personal and professional life. (Although, the only child in me hates me for it.) Motherhood has taught me to be kind; I know you will say that I have always been kind but now when a group of girls bicker at school, I encourage them to make friends and support one another because I dread the day that my daughter comes home broken-hearted after a fall out with friends. I encourage boys to be respectful of those around them because I want my son to respect his peers whether they be male or female, old or young. Losing you taught me that life is too short to hold a grudge and to refuse to say sorry and I encourage others to allow their grudges to subside also. I can even admit when I am wrong now (even though it pains me a little)! So, you have a granddaughter and most recently, a grandson. Your name is his middle name and it fits him perfectly – I have to admit that I was afraid that it wouldn’t. Also, I can see you in him, I really can. It’s when he scowls! Now, please don’t take that the wrong way – you didn’t scowl that often. I think of you everyday, Dad and it doesn’t hurt me to speak of you. In fact, I like speaking about you as it brings you back to me a little bit. Cancer somehow finds a way to bite its way into a lot of people’s lives and it hurts the most when I learn that sometimes my young students have such a heavy burden to bare. Your illness taught me how to empathise with others – particularly my students; it also allowed them to see me as another human and not just that teacher who ‘Googles’ the spellings of really difficult words! I am not a trained therapist and don’t pretend to be, but I am a pair of ears if they just want a sounding board. I remind myself often that I was lucky to have you for twenty eight years, but still cry behind closed doors on those days where I need you the most. I hope you’re proud that I stuck to this teaching malarky. I recall my mum telling me that you were pleased that I had finally found myself a career. Of course, you would never tell me that. You and I were the quiet ones in the family. I often speak to my daughter about you and constantly worry that one day she will notice that she only has one granddad. The Granddad she does have does a mighty fine job of loving his grandchildren enough for the both of you. He does so much for us as a family and both he and Grandma are there for us at a drop of a hat when we need them. I tell them both frequently that we would be lost without them. And that brings us round to the other Grandma. Your wife and my mum – my lovely mum. We bicker often, but she says it’s because she worries about me. Does that worry ever come to an end? I know one thing’s for sure – I don’t think I could breathe without her. Losing you made our mother daughter bond unbreakable and she is the cement that holds us together on the days when I feel weak. To this day, I don’t know how she stayed so strong when you were ill and I still feel like even though I was around, I was somehow absent, lost in a busy NQT year and embarking upon a new relationship with the now father of my children. I realise though that those final months and days were yours and Mum’s and not about me at all. Sometimes I forget that before you were mine, you both were and are people. Being a parent doesn’t define you; it’s just another string to your bow. As you can imagine, Grandma dotes on her grandchildren and I adore the happiness they bring her. Pictures of them are scattered around your home and she kisses the one on her phone every night before bed. I know that she speaks of you to my daughter and sometimes when I hear my girl say the words ‘Grandad Paul’ it tears me up inside because I wonder what kind of grandad you would have been. I imagine that you would be more involved as a grandfather, I don’t know why I think that – I just do. I try to explain where you are, but I am also aware that I am not ready for her to learn about some of the sadness and horrors we may face in this life. I do want her to know that I too, like her, once had a Dad who loved me the depth of his soul. You were a quiet person who would observe a conversation. Until, that is, you had a couple of beers inside you and then we could never shut you up! I recall begrudgingly having to pick you up from various pubs on Sunday afternoons and then bringing you home to sit at the dinner table by yourself and eat because Mum and I had already eaten. I wonder now, if you had your time again, would you do a few things differently? All I know is that I would give my right arm to be able to pick you up from the local pub now, even if I could smell Mum’s Yorkshire Puddings cooking in the oven. I hope we’ve done you proud Dad – Mum and I. And I hope that somewhere, wherever you may be, you can see your Grandchildren because they are well behaved (most of the time), polite and pretty flippin’ gorgeous. The girl can throw an awesome tantrum every now and again; she is still learning that, unlike us, she isn’t an only child. Lucky her though, because, unlike us, she will hopefully never have to bare the burden of going through the pain of losing a loved one alone. 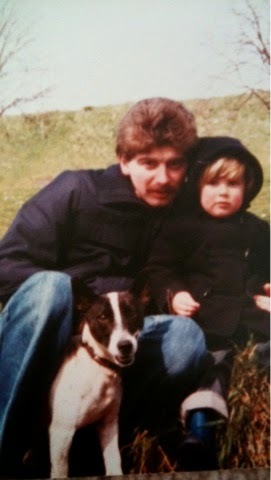 Pictures: Me, Dad and Ben the Dog. 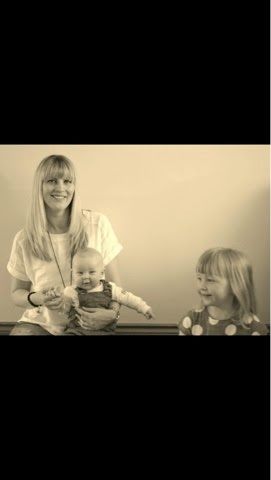 Me and the Munchkins. Ahh, I know it's close to home for you too Becky. I thought that when I was writing it. Thank you for reading it. 🙂 I have just had a quick look at your very professional blog. (Will read it thoroughly in the morning.) I too am a teacher and I am returning to work full time in a few weeks after having my second child. I may be calling on you for a few work/life balance tips! O bless you, it's so tough coming back to this world after the happy, calm, chilled life of maternity leave! Thank you. I wrote it a while ago when I was still using Blogger so I thought I would link it up to a few linkys now I am on WordPress. It was the first post I shared with my family and friends too. Thank you. It was a very cathartic experience writing it.